From July 22 to 27, 2019, the Coopérative des professeurs de musique will be hosting l’Académie musicale d’été at its Plateau-Mont-Royal location (4220 Drolet Street). The first edition is dedicated to the guitar. The wonderful Thomas Viloteau will be among us to inspire the new generation of musicians. Classes will be taught in both French and English. We invite interested guitarists to submit an application file. For music lovers, it will be possible to attend the master classes and other activities of the Academy for a small fee. AUDITIONS Candidates may apply until April 30th, or until full-enrollment is reached. Participants selected for the Académie will have to prepare 3 pieces (romantic, post-romantic, 3rd piece of your choice) and will be assigned to a guitar ensemble. Accommodation is not included. Contact us, and we will gladly help you find an appropriate lodging option. Jasmin Lacasse Roy is one of the most intense and honest artist of his generation. During his studies of the guitar at the Montreal Conservatory of Music and the University of Montreal, Jasmin was a top prize winner in many international music competitions including: Canadian Music Competition, Clermont Pépin competition, Music competiton "Bas-Richelieu" and the "Prix d'expression" of Quebec City, among others. He also as received the prestigious "Thérèse Filion" prize awarded at the Clermont Pépin international competition for the most outstanding performance of the competition. In 2008, Jasmin won first prize at the "Montreal Grand Prize of Guitar"and was also the laureate of a grant from the Council of Arts and Letters of Québec. After being the chosen performer for the 2007 Montreal Guitar Society’s “New Talent” Concert, Jasmin was invited to play at the McGill University’s Tanna Schulich hall, the “Chapelle Historique Bon- Pasteur” and the Museum of Fine Arts of Montreal. Jasmin was also a featured soloist at several international classical music festivals such as the Domaine Forget Music festival, the Guitar Festival of Ottawa and many guitar societies including the Montreal Guitar Society and Claude McKinnon Guitar Society. He has performed at the grand opening of the "Grande Bibliothéque de Montréal" and for the Montreal Guitar Salon. Jasmin was also invited to play at the Montreal Jazz Festival, an honor rarely given to a classical musician. 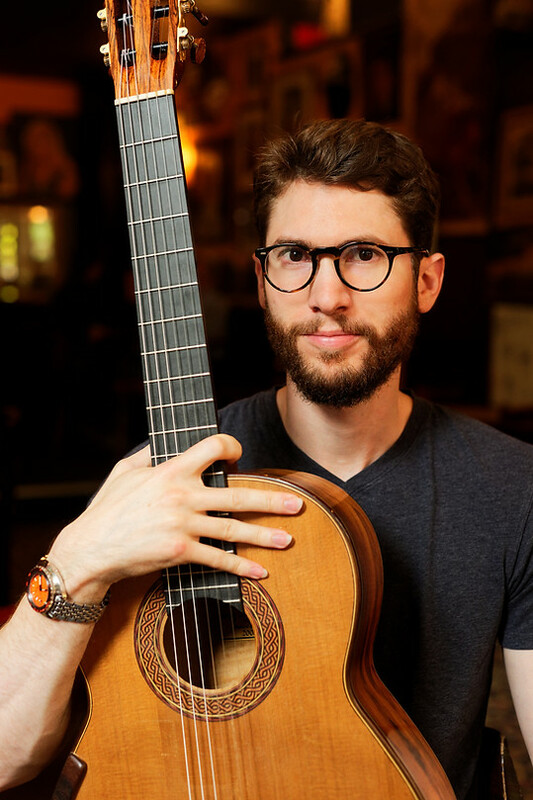 Pascal Valois has received the most renowned bursaries in Canada for guitar performance (Canada Council for the Arts) as well as musicology (FQRSC and SSHRC). He was also awarded scholarships from the Desjardins Foundation, the Wilfrid-Pelletier Foundation, the Laval University Foundation and the Université du Québec à Montréal Foundation. He studied romantic guitar on period instrument with Hopkinson Smith at the Schola Cantorum (Switzerland). Prior to this, he had graduated with honours at the Conservatoire de musique de Montréal, under Jean Vallières, as well as receiving the prize Pierre J. Jeanniot during his studies at Université du Québec à Montréal with Alvaro Pierri, in Montreal. He performed in the masterclasses of Ricardo Cobo, Roland Dyens, Fabio Zanon and William Kanengiser. Pascal Valois gave solo concerts on period and modern instruments in Switzerland, France, Latvia, Ontario, Quebec and New-Brunswick. While he maintained a busy concert schedule, Pascal Valois completed a Ph.D. in guitar performance practice at Laval University in 2009. He is also responsible for the publication of a series of scores dedicated to 19th century French guitar music at the Centre de Musique Romantique Française and at the Centre de Musique Baroque de Versailles. Rodrigo Simoes is a composer and arranger who develops a style in between jazz and Brazilian music. During his international career, he has performed in China, Australia, Brazil, Canada and Paraguay. The guitarist and mandolinist has already worked with big names in Brazil and Canada. He has a Bachelor's Degree in Music Education (FAP-PR) and a Master's Degree in Jazz Performance and Composition (UdeM). Thomas Viloteau's first concert was in his home country of France only a year after he began his studies, in front of an audience of 200 people. Since that concert, Thomas has played in some of the best venues through out the United States of America, Canada, Mexico, Germany, the Netherlands, Italy, Spain, Norway, Great Britain, Taiwan and Puerto Rico. Born into a family of fine arts enthusiasts, Thomas took his first lesson at the age of twelve. Although a late start for an internationally recognized musician, inspired by listening to Naxos recordings of other prominent classical musicians, Thomas decided at the outset of his career that he wanted to record such a CD too. Eager to learn as much as he could about his instrument, he immediately went on to study at an international level, moving from Barcelona, to Paris, San Francisco, London, Tucson, Rochester and Montréal seeking advice from some of the leading professors like Alvaro Pierri, Alberto Ponce, Judicaël Perroy, Tom Patterson, Roland Dyens, Nicholas Goluses, Paul O'Dette and Marc Teicholz. Equally as talented as a performer, Thomas has also proven his versatile abilities as a competitor. Thomas has placed in numerous international competitions, taking first prize in the Segovia Competition, Mottola, Ville d'Antony, Sernancelhe and in 2006, only nine years after he started playing, the renown Guitar Foundation of America International Competition which allowed him to record his first CD with the label Naxos. In the summer of 2012, after years away from competitions, he played for the first time at the Francisco Tàrrega Competition in Benicàssim, the oldest event of its kind, where he won the prestigious 1st prize. In December of 2015 he was the first guitarist to win the Arthur W. Foote Award from the Harvard Musical Association in Boston, a prize given each year to the best musician in the top music schools and conservatories in the United States. Always willing to push his passion for classical guitar further, Thomas has recently finished writing a book about the modern advanced techniques of the classical guitar. "In the Black Box - Technique(s) of the Classical Guitar" is based on his own experiments, thoughts and those of his teachers and contemporaries. With this book, Thomas has created a tool in helping others get to a point that he was able to accelerate to so quickly. Thomas Viloteau has released recordings with Naxos, La Ma de Guido and Mel Bay. In 2015 he produced his own record "Dances Through the Centuries," which includes the world premiere of the Suite Brasileira 3 by Sergio Assad, dedicated to Thomas and commissioned with a grant from the Northern Trust/Piper Enrichment Award. Thomas Viloteau has lived in Paris, Barcelona, San Francisco, New York City, London, Tucson, and Montréal. He is currently finishing his Doctoral Studies at the Eastman School of Music in Rochester, NY. He only uses Savarez strings and plays on guitars made by Greg Smallman and Bastien Burlot.